Interesting history. You should be able to understand, even if it is in French. Bepop is training for retrieving at Wendy's. Through patience and devotion, they're getting there!Bravo! The video is a bit foggy, but you can still see her coming out of the wooded area with her game. Good girl, La lula. I have moved several posts from yesterdya into Barbet Français, including the L, letter from the President of the SCC and added an E and a B.
I know it's sometimes difficult to find things..;I'm sorry. Trying to find info about the Rives d'Olt line. Well, it was under my nose. And it's logical!..Pfew. It is nice when things start working out in the puzzle. I'm sorry I can't post the ancestry because I'll find it on a database within 24 hours.Then I'll get accused of mispelling names! I also have a kennel name Merrylegs and another vom Rutelsetein, if anyone has any info? We're talking VBBFL and official pedigrees born in the 80's.And of course real Barbets with Barbet blood, npa*, nswda* no nothing. There were between 15 to 20 dogs born under this kennel name, all registered in Germany. 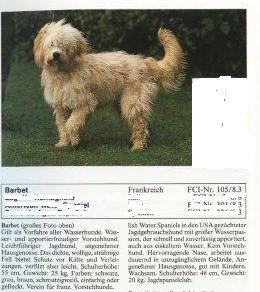 This document comes from a very popular book about dogs published in Germany in 1995. It's important to realise that the dog may have been completely brushed out and "too clean" so had limp hair. 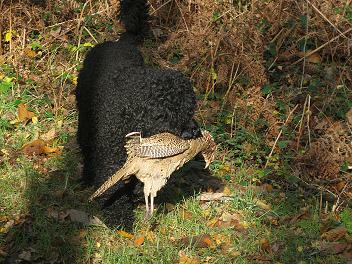 Of course, it is not comparable to the Grand Barbet frizzy that many were promoting at the time who was a pure poodle ( so short tight curls) and the object of all the fights over the Barbet and what it is, just like today.